Beautiful graphic wallpapers are such an impactful way of bringing vibrancy and visual interest to your interior design. 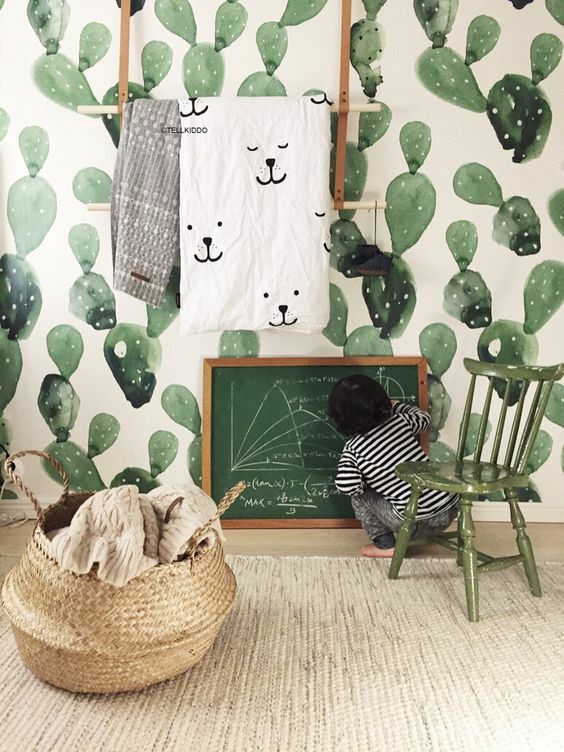 And this is especially true of Scandinavian brand ferm LIVING’s range of striking and easy-to-hang wallpaper designs, which can instantly transform a child’s room into a life-sized illustrated storybook. 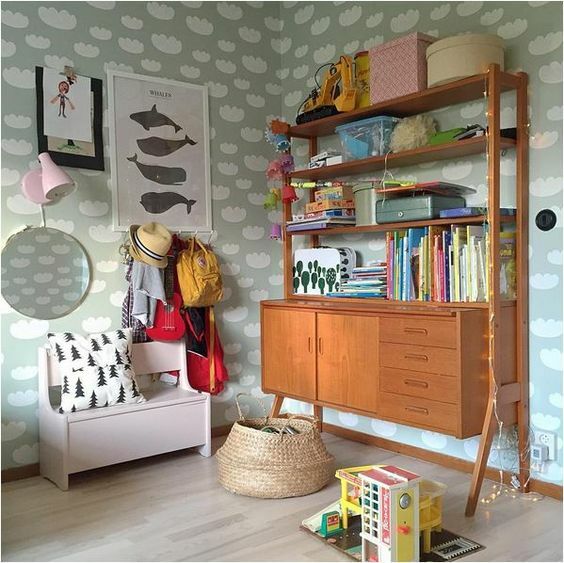 Created by Danish graphic designer Trine Anderson, the contemporary prints awash walls with colourful yet calming hues and quirky patterns that, although engenders a sense of childish innocence, appeals to adults and may ‘grow’ with the child as they enter from adolescence to teens. Using big vibrant patterns, of course, needn’t be daunting; the key thing to remember is, when using busy patterns, to temper this with flecks of plain soft textiles in your trappings as well as furniture with clean, sleek edges. This Harlequin design has been incorporated effectively into the room. The adjacent wall is white and softens the visual busyness of the patterns. A swathe of sleek plain fabric hanging from the ceiling to create a canopy offers respite from the repetitive graphics, and the furnishings – simple and white – complements the overall colour scheme. The white pop-pom style light injects further texture to the décor; a wonderful contrast to the crisp linear edges of the wallpaper and the surrounding furnishings. This tepee and totem pole graphic paper is beautifully intricate yet, because of the simple black / white colour scheme, is rather subtle in overall effect. Again, simple and plain furniture with clean edges provides a pleasant contrast to the patterns. Other graphics are introduced via soft furnishings and provides a burst of colour to what is a generally muted and neutral colour scheme. The white cloud patterns on this wallpaper design are soft yet striking; the pale grey/green hues create visual ambience and calm. This has been offset by accents of natural materials – from the dresser and wicker storage basket to the light wooden floors. Contrasting graphics provide a gentle and elegant clash of textures via cushions and patterned storage boxes. 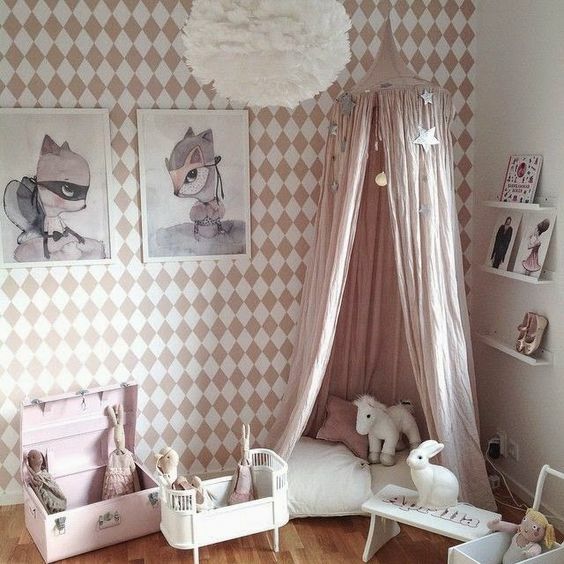 A fantastic example of how big patterns can create a calming environment. These watercolour effect cacti delineated in light to deep mossy shades of green make a striking feature wall for a room. 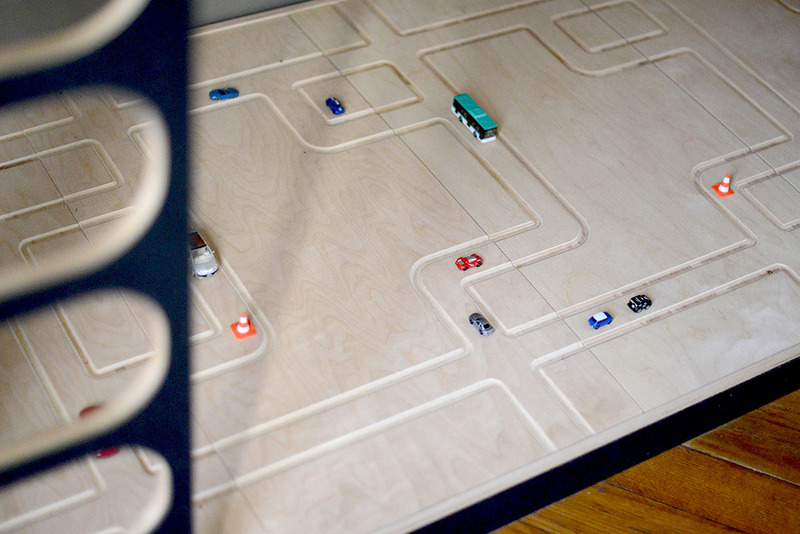 Once again, large patterns are shown to work effectively when complemented by simple furniture design. The plain yet textured floor gives the illusion of space and provides contrast to the bold wall design. 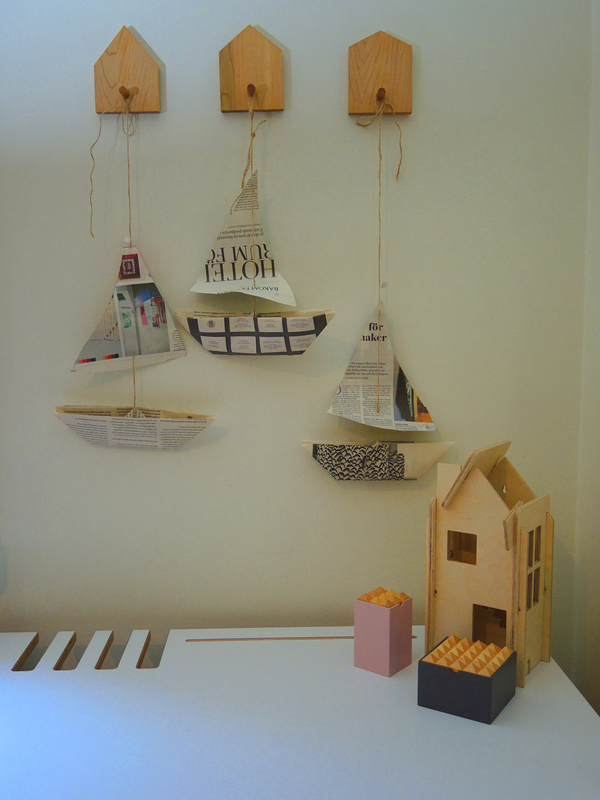 A simple wooden rack and wicker storage basket adds natural touches to a very earthy colour scheme. 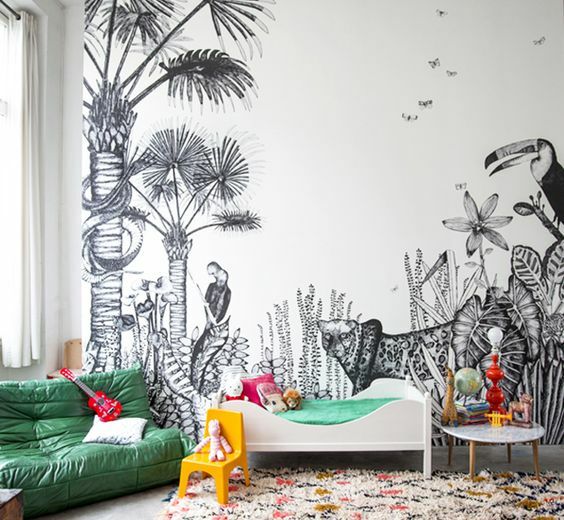 Large jungle scenic monochrome illustrations on this feature wall dominate the interior design and commands attention. This is a wall you can never tire looking at. The drawings are so beautifully intricate, and there is a lot of ‘action’ occurring in this scene. The power of the design speaks for itself and requires no further wall hangings or embellishments. Bursts of bold primary colours in the chair, sofa bed, cushions and table ornaments inject vibrancy into the room and provide a welcome contrast to an otherwise monochrome palette. Wallpaper can add visual dynamism and life to an interior design. Contemporary styles are becoming bigger and bolder but not overpowering. It provides a striking backdrop to your furnishings and can make the smaller, more understated details of your interior design really stand out. You can now view our latest collection of ferm LIVING wallpaper at E-Side. 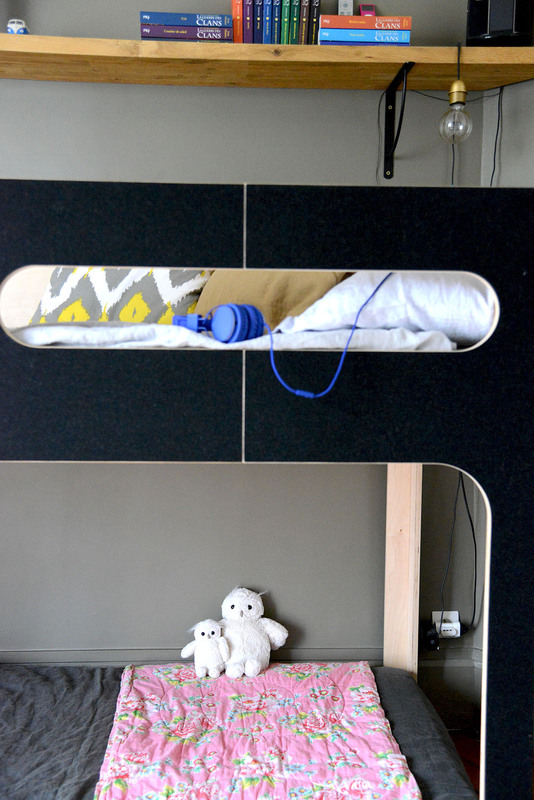 Amber in the Sky bed comes in different colors: Sand, Grey, Green, Orange, Red, Brown. Custom-colors available on request on customercare@e-side.co.uk. Swatch sample colors available. Amber in the Sky fits a mattress of 190 x 90 x max. 14 cm high. 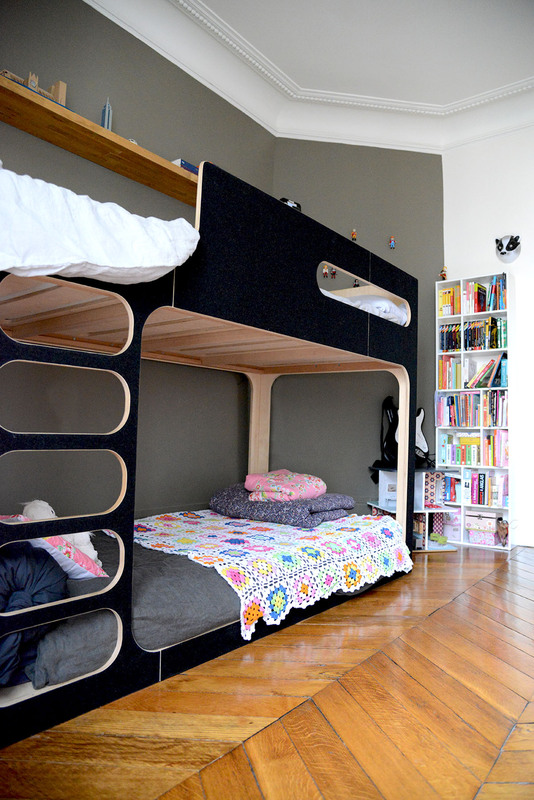 This bedroom belongs to Kira who is nine years old. 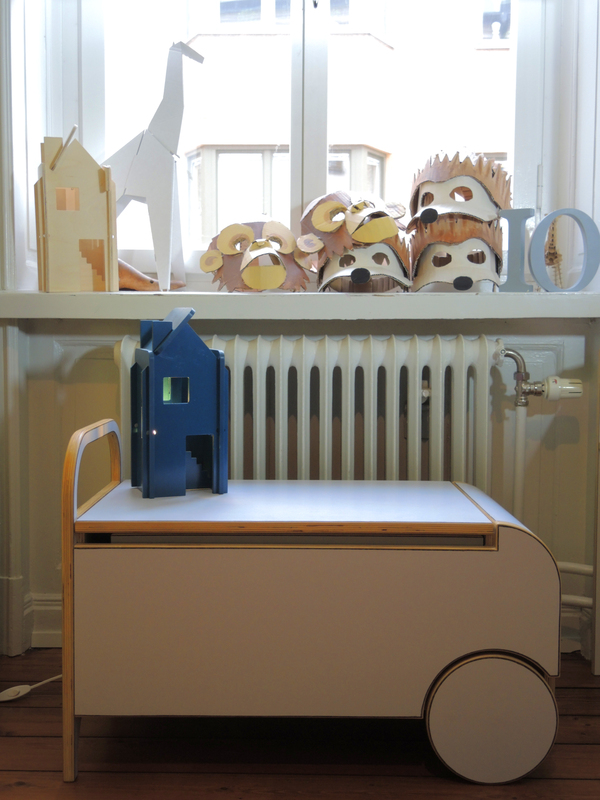 She lives with her parents and two sisters in an old apartment block in Stockholm, Sweden. 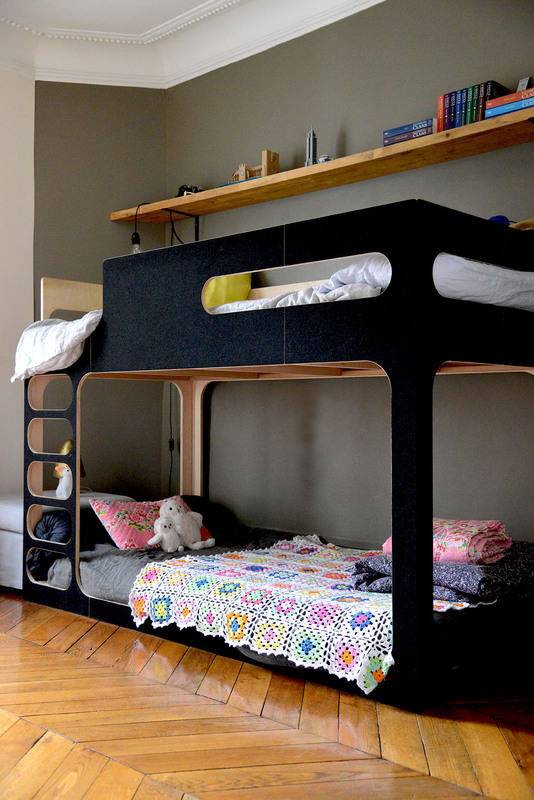 Kira shares her bedroom with her sister Masha who is six. 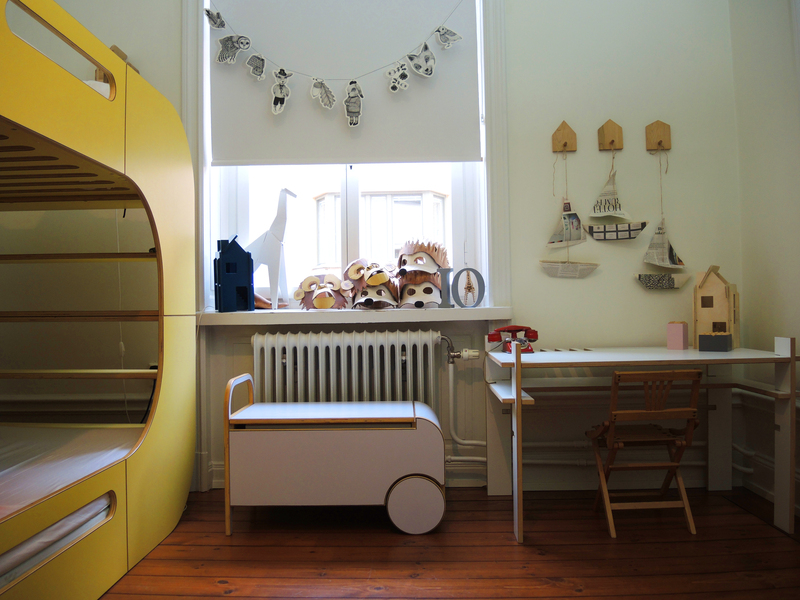 The girls’ bedroom was designed by their mum Mina, who is the founder of contemporary kids’ furniture brand IO Kids Design. 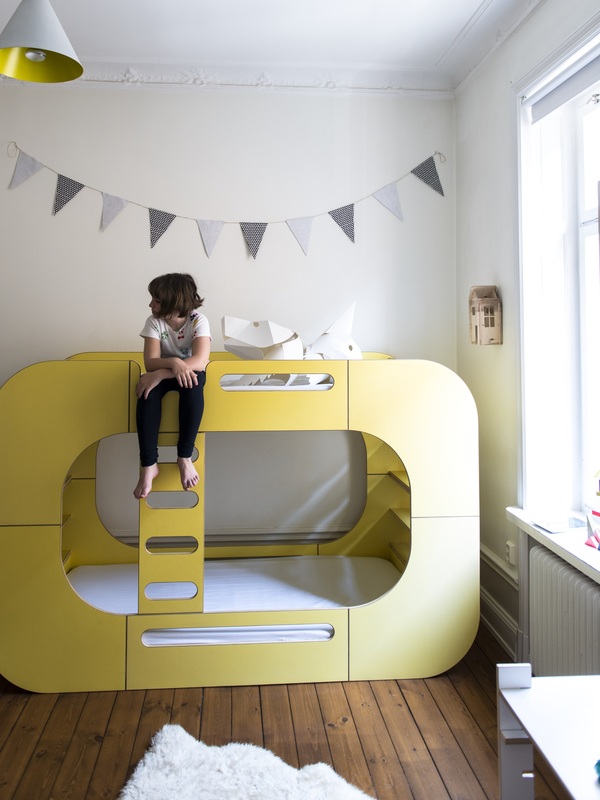 The room features a yellow IO Bunk Pod and is decorated with quirky details. 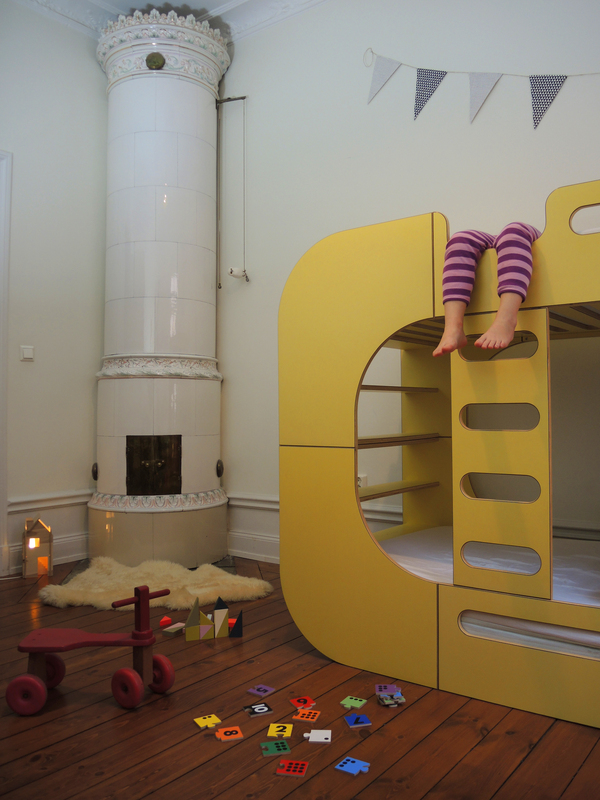 We love the gorgeous tile corner fire and the wooden floor which look great with the bright yellow of the bed.